His real name was Fritz Herz; he was the son of a Viennese dentist. He was trained by pedagogue Hermann Grün in Vienna and his first part sang in 1892 at the Rudolfsheimer Volkstheater in Vienna in "Les dragons de Villars" of Maillart. Afterwards he guested in Ischl as Canio in ‘’Pagliacci’’ and Turiddu in ‘’Cavalleria Rusticana’’. In the 1893-1896 seasons he was engaged as the first Tenor-Buffo by the theaters of Cologne and Bonn. Now he turned to the operetta and joined in 1896 to the Theater an der Wien. There he had in operetta "Der Schmetterling" (as Rosefleur) by Weinberger a prominent success. In 1898, under the impresario Jauner, he took part in the Russia tour of a Viennese operetta ensemble. He made guest performance at the Berliner Theater des Westens in opera "Der Husar" by I. Brüll. In Vienna he appeared only 200 times at the Carl Theater as Niki in operetta "Ein Waltertraum" by Oscar Straus. Then he performed in Munich, Stuttgart, Mannheim and Karlsruhe and in the 1900-1902 and again in the 1904-1906 seasons he was a member of the Theater am Gärtnerplatz in München. 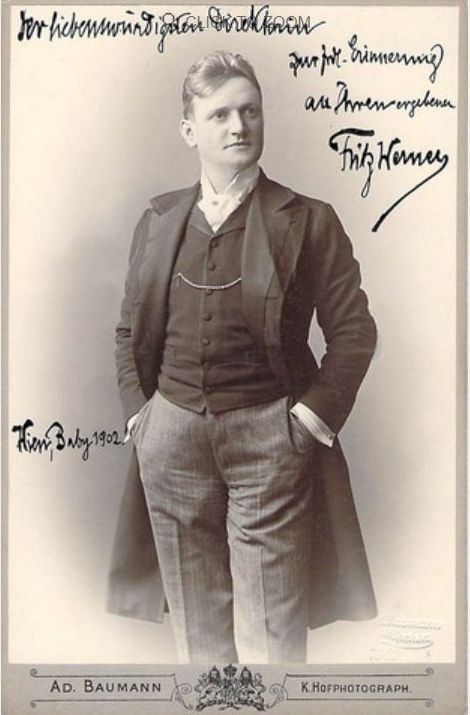 in the 1902-1903 season he was engaged by the Viennese Carl Theater, where he also made appearances in the 1907-1910 seasons. In the 1913-1914 season he was active as a singer and director at the Viennese Bürgertheater; then he was active at the Metropoltheater in Berlin, Operettentheater in Hamburg and in the 1924-1925 season at the Corso-Theater in Zürich. In 1926 he retired because of a heavy illness. He appeared in a huge number of operetta premieres, among other things: "Der Frauenfresser" by E. Eysler (Bürgertheater Wien 1911), "Der lachende Ehemann" of the same composer (Bürgertheater Wien 1913), "Die Winzerbraut" of O. Nedbal (Theater an der Wien 1916) and "Das Hollandweibchen" of E. Kálmán (Johann Strauß-Theater Wien 1920), "Ein Walzertraum" (Carl-Theater 1907) and "Rund um die Liebe" by Oscar Straus (Johann Strauß-Theater 1914) as well as the operetta ‘’Mädi’’ of Robert Stolz (Berlin Theater 1920).